No need to go to a restaurant for great chicken piccata, it’s easy to make at home, in just 30 minutes! This version uses bright lemon flavor to really accentuate the light and fresh qualities of the meal. Soon to be your family’s favorite! My love affair with Italian food continues! Chicken piccata has always been one of those meals we ate at restaurants… it was “restaurant food”. Even though there are a ton of recipes out there, for some reason, I never tried making it. 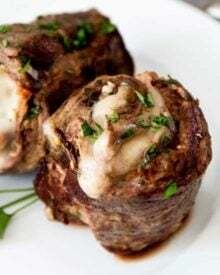 Well a little while back I finally decided that was stupid and I came up with a great recipe that we love! The freshness in this dish is just out of this world… crazy good! Good enough that despite there being “green things” and “onion things” in this dish… my kids ate, and loved it. SCORE!! The longest part about cooking this meal, is waiting for the pasta water to boil. You can get this meal on the table in 30 minutes, so it’s perfect for a hectic weeknight meal. If you feel like being ambitious or making this on a weekend, it would be delicious with these copycat Olive Garden breadsticks or a no-knead artisan bread. To start this off, you need some chicken breasts, which I chose to pound thinner. 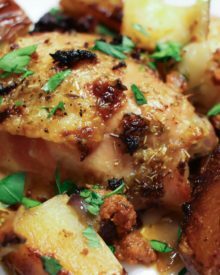 You could also use chicken tenders for this 🙂 You’ll be breading the chicken, but not in the traditional way… instead of dipping the chicken in flour, egg, and breadcrumbs… you’ll just be tossing it in some seasoned flour and then searing them up in a skillet. I seared my chicken in batches of 2, so they could get brown and not end up steaming because they were too close together. 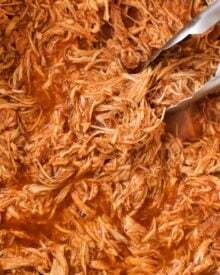 You want that golden brown color, because not only does it make the chicken delicious, those browned bits in the pan will make your sauce phenomenal! Once your chicken is cooked through and golden brown, set it aside to rest on a plate. Add your shallots and garlic to the same pan and let them saute for a minute or so, then add in the rest of your sauce ingredients. Not the prettiest sauce while it’s cooking… but the flavor is wayyyyy better than it looks! Let the sauce bubble and cook for a few minutes. While it’s cooking, drop your pasta in the boiling water. Once it’s cooked to al dente, or your preferred doneness, drain it and toss it with some olive oil, parsley and basil. Now I don’t know about you… but I could eat that bowl of pasta just like that!! Just slice up your chicken and add it to your pasta. 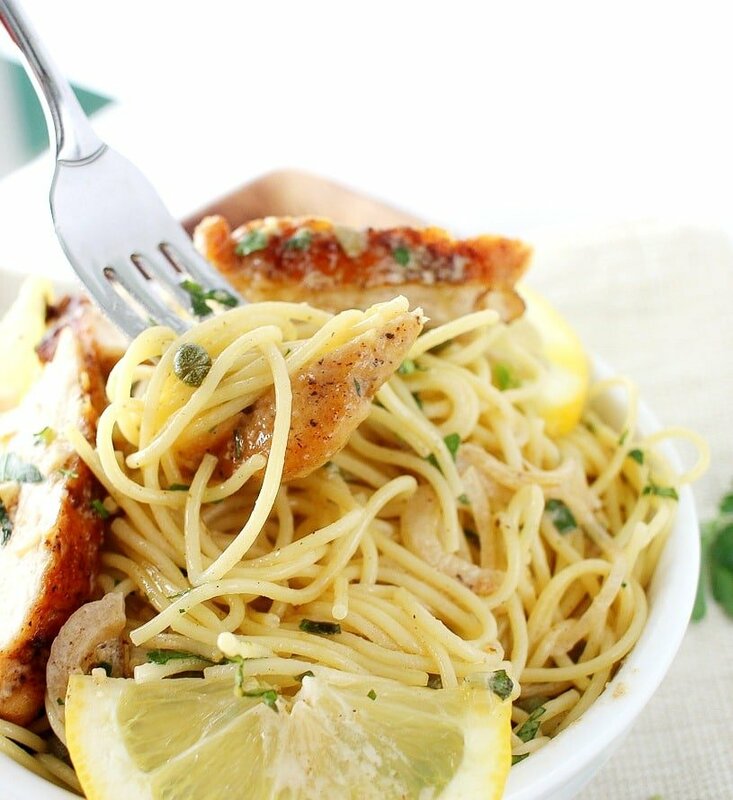 Garnish with some lemon slices, then pour your sauce over the pasta and chicken. Sprinkle some fresh basil all over the top and enjoy!! I hope you try this one you guys, I know you’ll love it! A quick and easy classic Italian dish, on your table in 30 minutes! 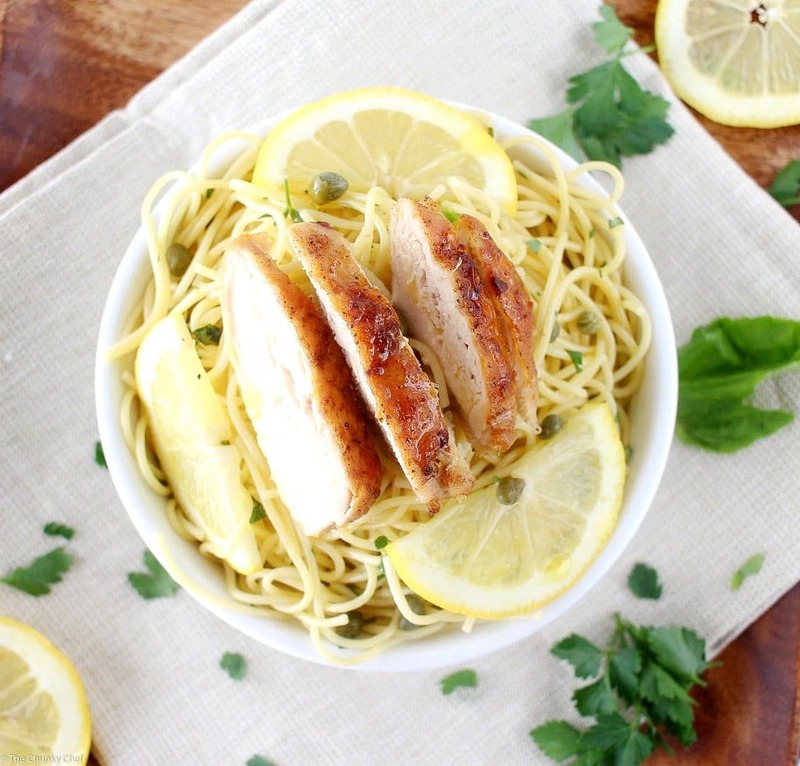 Your family will love the bright fresh flavors of this easy lemon chicken piccata. Heat butter and oil in a skillet over medium high heat. Season flour with salt, pepper and chopped fresh basil. Add thyme, salt and pepper to each side of the chicken breasts, then dredge in the seasoned flour. 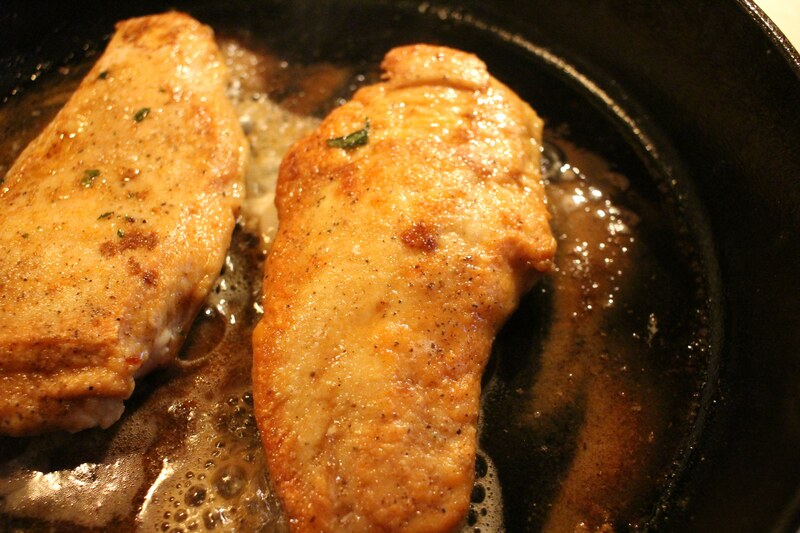 Place the chicken breasts in the skillet. 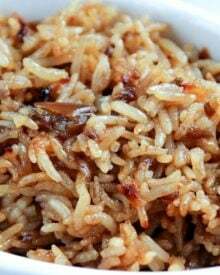 Cook in batches of 2 (unless you have a huge skillet) to ensure a golden brown exterior. Cook for about 4 minutes on each side, or until chicken is completely cooked through. Remove chicken to a plate and set aside. Repeat with remaining chicken breasts. Drop your pasta in salted boiling water and cook until al dente (according to package directions). Reduce the heat to medium low. Add shallots and garlic to the same skillet, stir to saute for 1 minute. 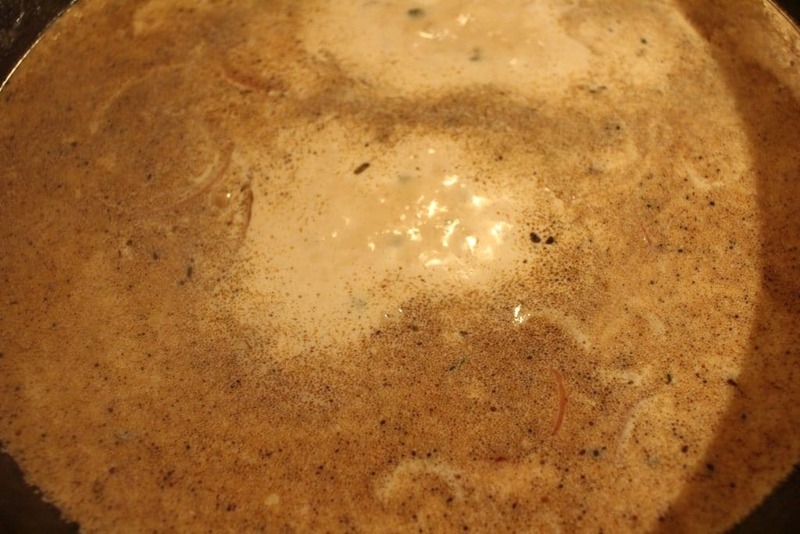 Add stock, wine, lemon juice, heavy cream, and capers. Whisk to combine and bring the sauce to a low boil. Taste the sauce and adjust salt and pepper if necessary. 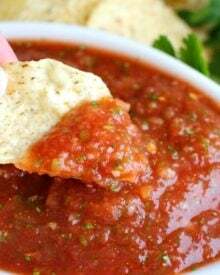 Simmer the sauce for 3 minutes. Drain pasta, place in a bowl, drizzle with olive oil and add fresh basil and parsley, and toss to combine. 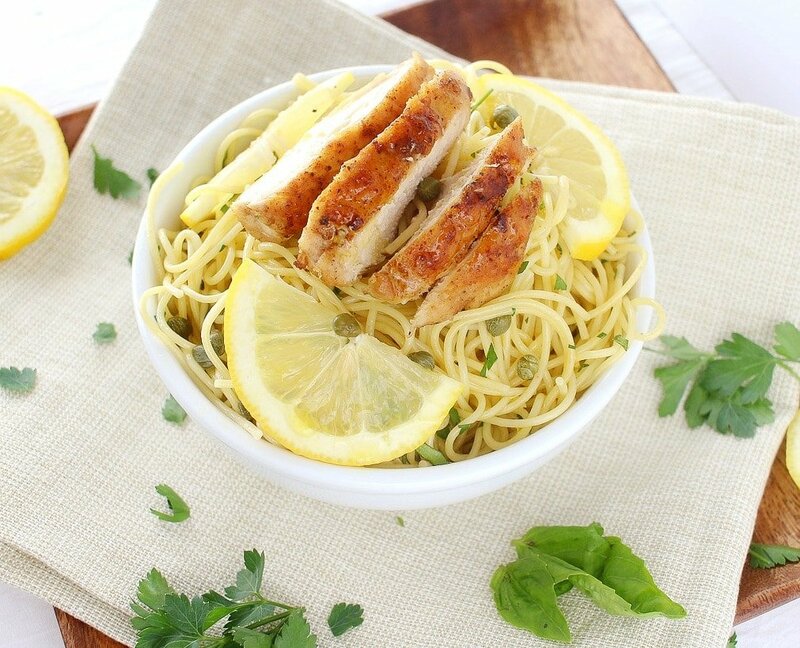 Slice the chicken into strips and place over cooked pasta. Pour sauce over the top and garnish with chopped parsley and basil. ** If desired, serve with cooked pancetta or bacon as an additional garnish. When I saw this I could not wait to get my hands to make this. I was excited. I did, however, use thin cut chicken breast instead of the regular 4-pack, and I added creole seasoning to season the breasts for a little bit more flavor than the thyme. Hey, I want to try this recipe, but for some reason I can’t see how much heavy cream and capers are needed. I just see ” / ” cups. Any help on this would be appreciated. Thank you!!! Hi Heather! Unfortunately when I redesigned my site, there were some bugs in the coding of the recipe plugin.. I’m working on it, but with over 200 recipes, it’s taking a bit of time :/ It should read 3/4 cup heavy cream and 1/4 cup capers 🙂 Hope you love it!! Hi Nancy 🙂 Thanks so much, I hope you love it! This pasta looks amazing!! I’m wishing I could grab a bowl through my screen right now. I also love that it’s a 30 minute meal. Genius!! 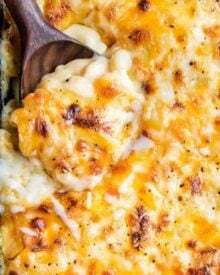 So adding this to my menu rotation asap! Pinned. Thank you so much Cyndi!! 😀 I hope you love it! Oh my! I could use something lemony like this. It’s been so dreary here and lemon always cheers me up. This looks fantastic! Chicken piccata always hits the spot in my house! Sure this one will be a big hit! Looks amazingly delicious! Great photos! Looks really fresh and delicious! Italian food is the best! Love Chicken Piccata and I love pasta. What a great combo, and so easy to make. OMG This was so delicious. Between my grand daughter’s family and my husband and I it received five 8s out of 10 for both appearance and taste and one 9 out of 10. Thanks for a super recipe. My grand daughter and I have started cooking together one night a week – long distance via skype. 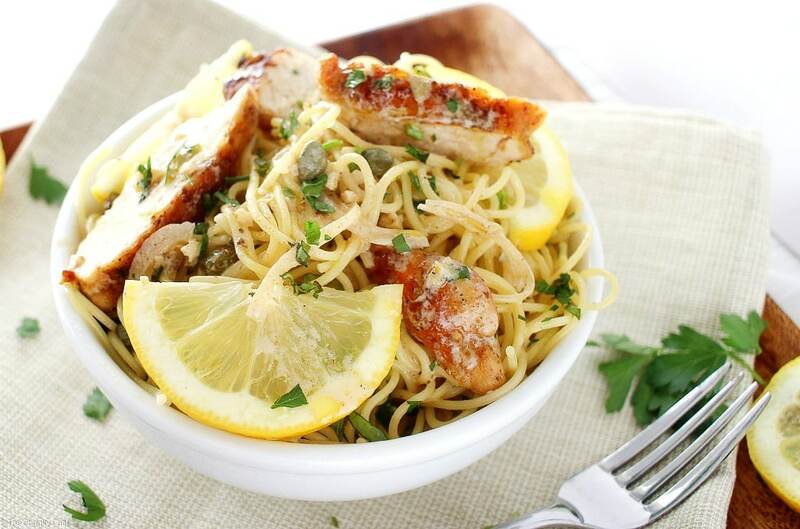 Your Lemon Chicken Piccata recipe is what she has chosen for this week’s meal. I am curious abou the lemon juice. When it says to add lemon juice to the sauce – is that the entire juice of the two lemons? Hi Brenda, I think that’s am amazing thing you two are doing… cooking together via skype. Love it!! Yes, it’s the juice of both lemons. If your lemons are really juicy, you could use the juice of one lemon and then taste the sauce to see if you’d like to use the remaining lemon 🙂 I hope you both love it!! I made this for the first time tonight. I had to modify a little bit due to what I had on hand (no capers, extra broth instead of wine), but it was FANTASTIC! I was a bit weary of the lemon/pasta combo, but it is so good. Even the noodles without the chicken is wonderful and I bet it will be even better for lunch tomorrow. 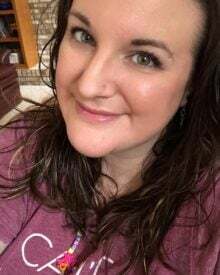 Jessica, I am SOOOO happy to hear how much you loved the dish!!! I love comments like yours 🙂 You’re right, the leftovers are just wonderful! I TOTALLY think of chicken picot as restaurant food! I’ve made it before, but not for a LONG time…I will have to give your recipe a try! I just wrote “chicken” on my shopping list after printing this recipe! 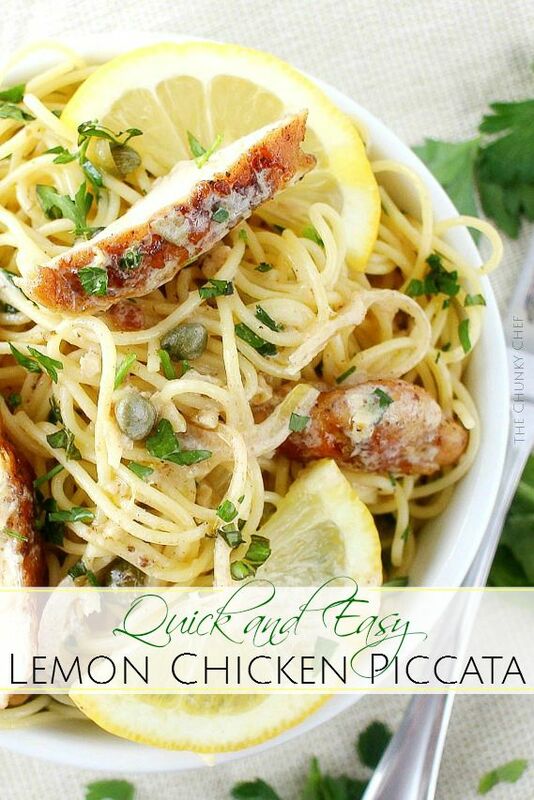 i always order chicken piccata too and I love that you shared this easy recipe for it!! 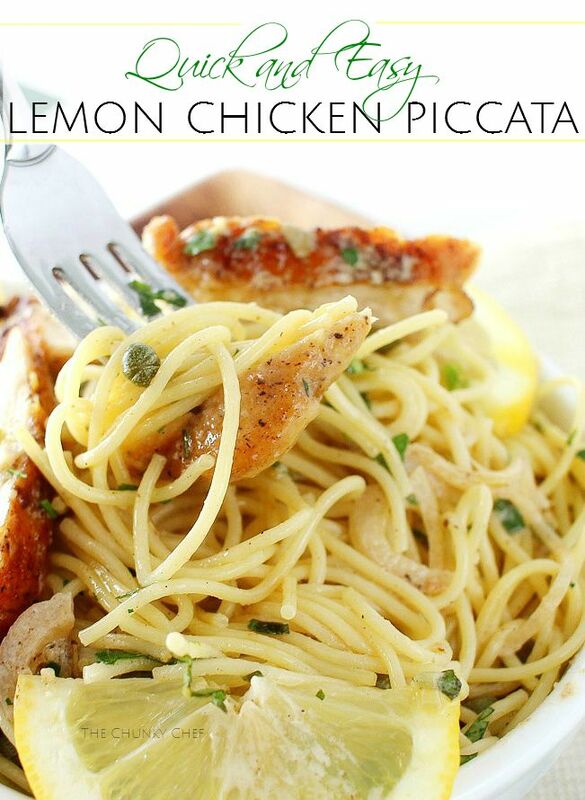 We are HUGE fans of chicken piccata – this is going on my to do list! Thanks for sharing! 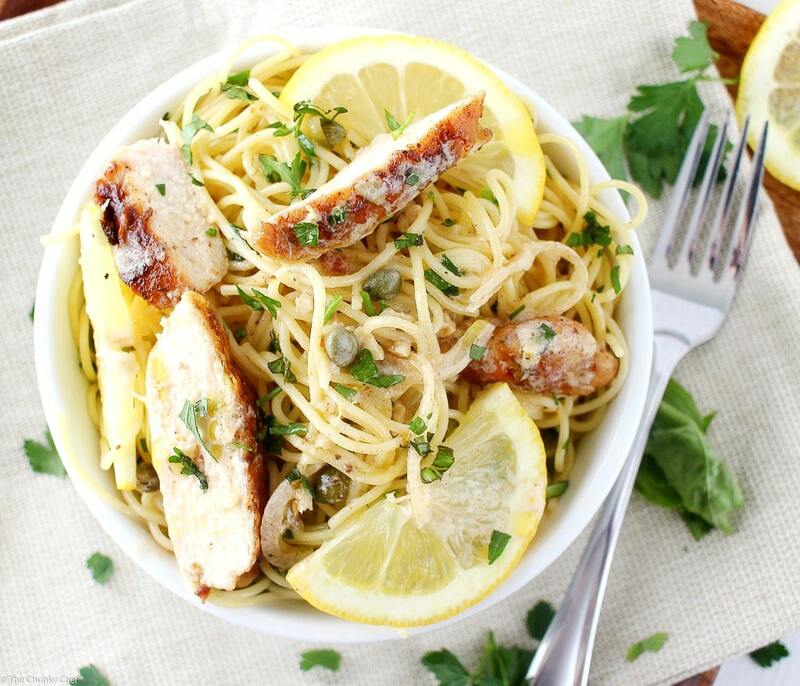 I’ve actually never had chicken piccata, but it looks amazing so I think I need to change that! I can’t believe it, but I’ve never tried chicken piccata before (hides head in shame). It looks so simple and delicious! Perfect weeknight dinner. Gorgeous photos, too! Chicken Piccata is one of my all time favorite dishes. There’s just something about the lemon and capers that are amazing together. You received the most clicks last week, over at Simple Supper Tuesday. We would love for you to join us again, starting Monday night at 8pm EST. It’s one of mine too, the simple flavors just mesh so well 🙂 Oh wow, I’m so honored that this recipe received the most clicks, thank you for hosting such a great party! See you this evening! 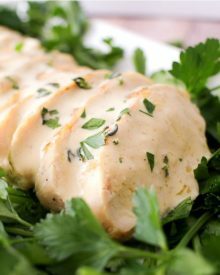 I can’t wait to try your Lemon Chicken Piccata it looks so good. Hope you are having a great week and thanks so much for sharing with Full Plate Thursday. Thank you so much Karen!! Oh I sure hope you LOVE it 😀 😀 Happy Tuesday! Hearty meal..just how I like it.. 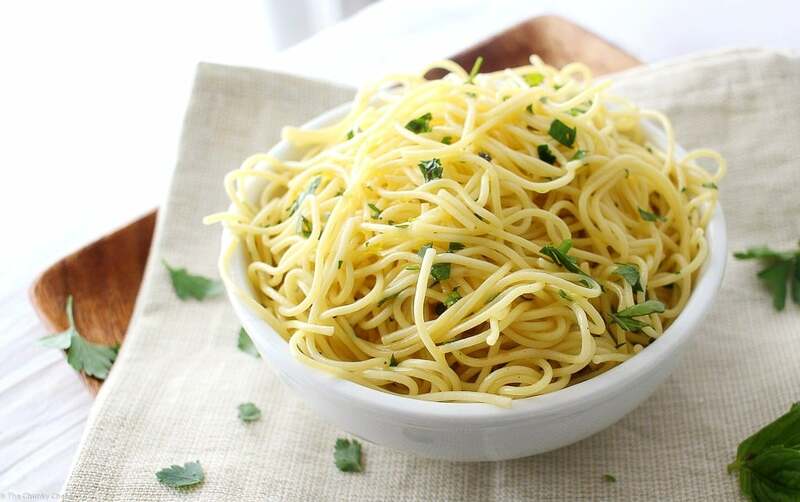 I love pasta with lemon, it is so light and fresh! This looks absolutely divine! Looks so fresh and delicious. I’ll have mine over zunoodles. You’re so welcome Tracey… what a great idea to have this over zunoodles!! I need to get a spiral slicer thing so I can make those, they sound so good!! I love how simple this sounds, yet oh so flavorful. And, I’m glad you’re exploring Italian cuisine, there are so many different dishes to try. Happy FF, and have a wonderful weekend! Thank you so much Kaila!! Italian is definitely one of my favorite cuisines, I’ve yet to try a meal I didn’t like 🙂 Enjoy your weekend as well! I can’t tell you how incredible this looks… As somebody obsessed with lemon, this hits every one of my sweet spots! Thank you for posting this and I can’t wait to repin it for folks! My sister will die! LOL! Thank you SO much Jerusha!! 😀 I’m a huge lemon lover (well all citrus)… I hope you and your folks love it!! I love Piccata! 😀 Can’t wait to try this recipe Amanda! The pictures look phenomenal! pinning and saving to add to the menu soon!! Yes, I am definitely pinning this one Amanda and I will have to try it this weekend. OMG. I LOVEEEEE (LOVE LOVE) Chicken Piccataaaaa! The only person who loves it more than I do is my huzzzzzzzband. So he’s going to LOVE you for this… I can nottt wait to make it. Your pics, as usual, are insaneeeee!!!!!! Ahhhhh, thank you sista!!!! I know you’ll both just loooooove it 😀 I’m usually not a caper fan, but I definitely eat them in a chicken piccata! 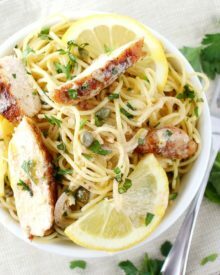 My kids love lemon chicken piccata and I do too…this is one of those dishes I make almost every week, because I know everyone will eat it! Glad to have another recipe to try. Your photos are gorgeous!